Chocolate is mandatory on Valentine’s Day, right? And, if we have to get all mushy, we might as well get something tasty out of it. So this year, instead of giving the predictable box of subpar chocolates, give a gift that’s really from the heart, VEGAN DARK CHOCOLATE TRUFFLES. This vegan dark chocolate truffle recipe is perfect for anyone in your life. 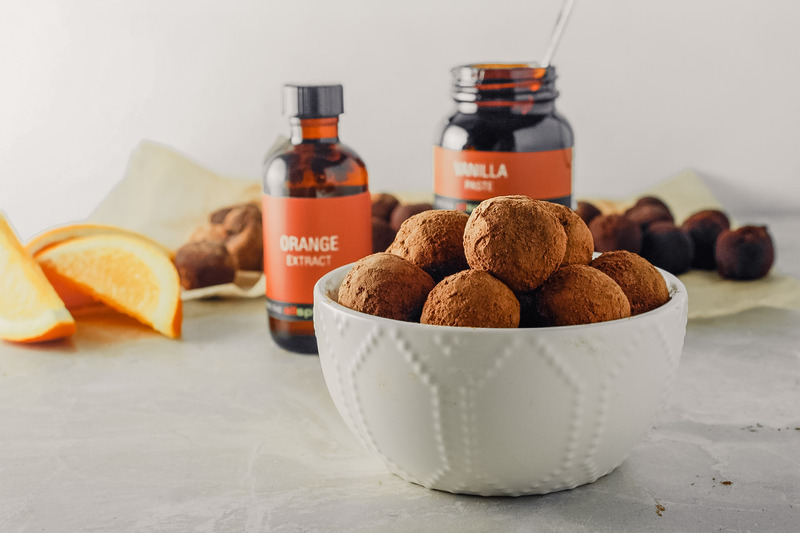 Whether you’re gifting to friends, co-workers or a certain someone; these orange-infused truffles are special, thoughtful and decadent all rolled into one melt-in-your-mouth package. I describe it as a spice shop—for lack of a better term—because it offers so much more than just spices. They carry a myriad of pure extracts, oils and vinegars, rubs and marinades, dried mushrooms, sugars, dried chiles—you get it. And, while they have all of your basics, it’s their exotic and interesting products that make this shop a destination. From black walnut extract and Amchur or Amchoor powder (made from sun-dried green mangoes), to ghost pepper salt, you’re guaranteed to leave newly inspired with one-of-a-kind ingredients in hand. 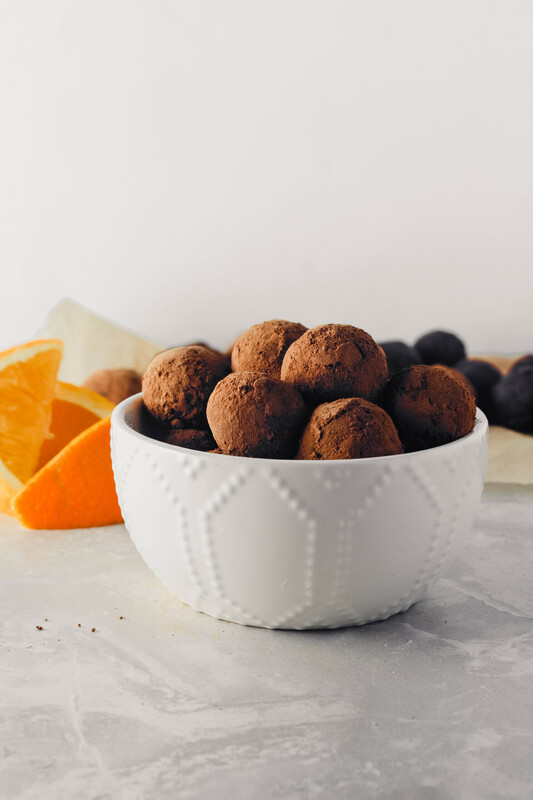 These Vegan Dark Chocolate & Orange Truffles use vanilla bean paste and pure orange extract to create an exceptional treat. Vanilla bean paste is one of my favorite ingredients to use in baked goods and treats because it adds tiny gorgeous flecks and a punch of vanilla that you just can’t get from extract. A jar of vanilla bean paste will cost you more than extract but it’s not nearly as expensive as buying whole vanilla beans. Looking for some more romance? Check out these Dark Chocolate Red Wine Truffles (not vegan but oh-so romantic)! How long does vanilla bean paste last? Vanilla bean paste will keep at room temperature for about 3 years and can be substituted (1:1) for extract in most recipes. Is pure extract really necessary? 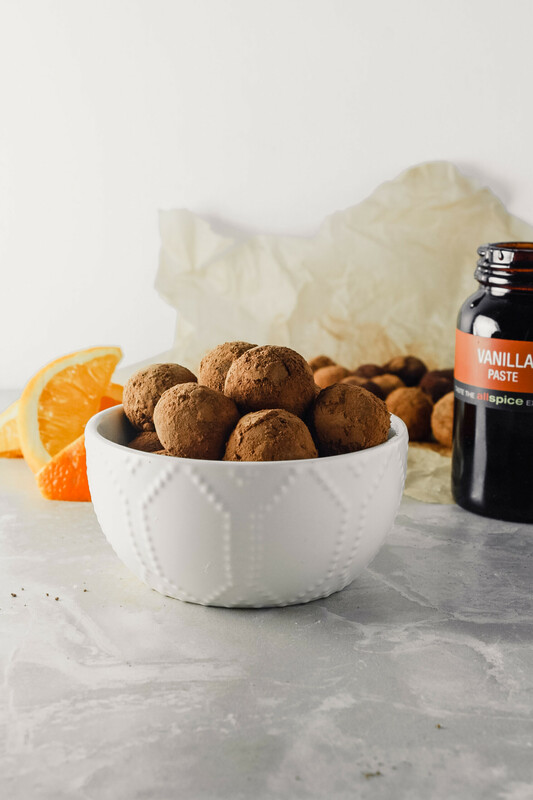 Now about the orange, just a splash of pure extract makes these truffles stand out from all the rest, adding just the right amount of orange essence without taking over the show. For this recipe, and really any recipe that calls of an extract, pure is always, always best. Most grocery stores will carry pure vanilla, lemon and almond extracts, but orange can be harder to find. Specialty stores, like Allspice, will be your best bet for finding pure orange extract, and any other extracts you may need. How do you make chocolate truffles vegan? To make dark chocolate truffles that are just as decadent, smooth and silky you must turn to canned coconut milk. It works wonders in place of the commonly used heavy cream. This recipe has been developed to work with both full-fat and light coconut milk. The light coconut milk surprisingly lends a good amount of creaminess, but full-fat will of course be even creamier. For the best texture, be sure to enjoy them at room temperature for best quality. Place chocolate in a glass or metal bowl, set aside. In a glass measuring cup, heat coconut milk on high until just starting to simmer, 1–1 ½ minutes. Pour hot coconut milk over chocolate, cover with plastic wrap and let sit 5 minutes. Add extract, vanilla bean paste, and salt; gently stir ganache until smooth and completely incorporated. Transfer ganache to an 8-inch square baking dish, and spread into an even layer. Let sit at room temperature for 1 hour, then cover and refrigerate until firm and scoopable, about 1 hour. Line a baking sheet with parchment paper. Scoop ganache by teaspoon, gently roll between palms, and transfer to prepared sheet, refrigerate 30 minutes. Roll truffles in cocoa then transfer to an airtight container and store in refrigerator. Bring to room temperature before enjoying. Bring truffles to room temperature before enjoying. This post was created in collaboration with Allspice Culinarium, as always all thoughts and opinions are 100% my own. Everything about these sound delicious! Great photos, too!